DETROIT (Cobo Center)—A most anticipated plenary session was held during the Nation of Islam’s annual Saviours’ Day Convention. Titled “The War on Islam: 9-11 Revisited, Uncovered and Exposed,” the session featured a distinguished professional panel of presenters who spearheaded a well-documented, thought provoking discussion on what 9-11 was really about. It concluded that the atrocity was not committed by some poorly trained ragged Arab terrorist who somehow managed to skillfully fly large Boeing aircraft into the New York Trade Center Towers. Rather it was a well thought out plan used to dupe the American public—straight out of the “Mission Impossible” playbook. And it was used to create open ended war and destabilize the Middle East. What came out of the Feb. 18 session was the revelation that the incident was never treated as a crime and thus never investigated as such. It was declared an act of war focusing on a nebulous Islamic enemy and America has been at war with the nebulous enemy ever since. It has, however, had a serious impact on our civil liberties with the Patriot Act, domestic and foreign policies and a heightened age of Islamophobia. In laying the foundation for the presentation, Dr. Kevin Barrett, who holds a PhD. in Islamic Studies and is one of America’s best known critics of the War on Terror, detailed the meaning and strategy of a “False Flag Operation.” He called the World Trade Center tragedy such an operation. A false flag operation is a war strategy that has been used for centuries. It involves staging a horrific event and pinning the blame on a patsy or rival for political gain. It started as a naval term, Dr. Barrett explained. He took the audience all the way back to the time of the Emperor Nero in 64 A.D. when he burned Rome, placed the blame on Christians and created an avenue for their persecution. He cited many examples of false flag operations perpetrated by the U.S. government—including the attack on the battleship the Maine in 1898 which sparked the Spanish American War and was used to steal Spanish colonies in the Western hemisphere. Then there was the sinking of the Lusitania in 1915 which was used to justify the American entry into WW I and bombing of Pearl Harbor which was the model for 9-11 attack, said Dr. Barrett. With 9-11 the goal was to attack and destroy Muslim nations and go to war against Islam to remake the Middle East, protect Israel, control oil in the region and preserve American hegemony. Richard Gage, an architect with over 25 years’ experience, is founder and CEO of Architects and Engineers for 911 Truth. During his presentation to the very receptive audience, he demonstrated in a very factual manner how it was impossible for fire to bring the Twin Towers in New York down in the manner that is presented by the popular narrative—planes flew into the towers and a combination of jet fuel and fire was blamed for their collapse. “The towers were not brought down as a result of being hit by an airplane,” he told the audience. Small office fires could not have done the job, he added. “If you study the tapes you will find the buildings came down symmetrically similar to what you will find when you implode a building and you have to use explosives,” said the veteran engineer. He then used a chart depicting the 10 key characteristics of a demolition and the way the Trade Center Towers fell matched the list exactly. To further buttress his argument, he documented how 118 NYC firefighters stated they saw flashes and heard explosions. Many stated it “looked like a controlled demolition,” he said. Mr. Gage, as he built his case skillfully like a trial lawyer, argued that the buildings were in free fall and shattered. “There were no signs of stacked up floor panels you would find if a building simply collapsed,” he pointed out. Other evidence used to prove the myth of a progressive collapse was the presence of molten metal in the debris. Lastly Mr. Gage pointed out that nano-thermite was found in the dust. “It is a very sophisticated material with explosive properties,” he said. Bringing final rebuttal to the 9-11 myth was Mr. Christopher Bollyn, an investigative journalist. He has been covering the attacks since the day they occurred. He placed the why on the door steps of Zionists in Israel, who he pointed out have a lifelong agenda of aggression, terror and conquest. During his presentation, he showed their hidden hand, saying the idea for 9-11 was conceived in Israel in 1970. “The Israeli Stratagem was to trick the United States to wage war against its enemies,” he said. Mr. Bollyn documented how the Israeli intelligence agency Mossad was very much involved. “There is solid evidence that Israeli intelligence agencies had prior knowledge of 9-11, which is indicative of involvement in the attacks,” he said. “The rabid Zionist neo-cons who dominated the Bush administration pushed the War on Terror with its criminal wars of aggression, occupation and Balkanization (breaking countries down into small parts) in the Middle East as the strategic response to 9-11,” Mr. Bollyn said. The targeted countries have fallen like dominoes—Iraqi, Syria, Sudan, Libya with the main prize still on the table, Iran. In attendance at the plenary Feb. 18 was noted Muslim scholar Dr. Wesley Muhammad. He told The Final Call that he found the discussion powerful. “We had thousands in attendance and 60,000 viewers online,” he said. “We have irrefutable proof given that not only was 9-11 an inside job, but we have identified the perpetrators. It goes right up to the enemies of the Honorable Minister Louis Farrakhan, Israel itself, now the truth is out. 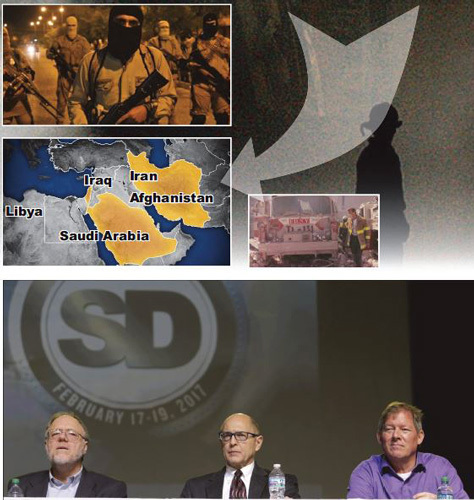 “We are able to see and detect false flag strategy now. As one of our guests so eloquently indicated there is only one religious leader or head who is courageous enough to have alerted the world that the Muslims did not do this. This is a war on Islam and the war is orchestrated in D.C., but ultimately in Israel,” Dr. Wesley Muhammad concluded. “I would say this session prepares us to know what to expect from our government on the attack of Islam and the Nation of Islam in America,” said Sidney Muhammad. “This is preparing us to be on our post. We have the points now on how to spot and identify false flags, and like the Minister said to be on the wall, watching for these things. And calling it to the attention of our people, not to fall victim ever again to these tactics, ever again. Our general orders are in full effect,” he said.